Well it’s April, spring has sprung, Easter is behind us now and the sun is higher in the sky as the days are a little warmer every day. The humidity is rising noticeably in the direct sun, yet the evenings are alive with life as the cool tropical breezes cool Puerto Vallarta’s night life down from a fever pitch. Yes friends’ it´s that time again when tourism starts to wind down and the fishing turns to thoughts of World Record Possibilities at our world famous fishing grounds. Puerto Vallarta and the fair weather fisherman is seldom a combination that is easily met. But for now we have cool weather and hot fishing. The Whales have bid farewell to Puerto Vallarta until next December when Natures Dance is once again in the endless rituals of survival, birth and the seasons changing. In Spring Puerto Vallarta goes through a transition period from winter tourism to summer visitors on a parallel lifecycle as our fishing, strange but true. 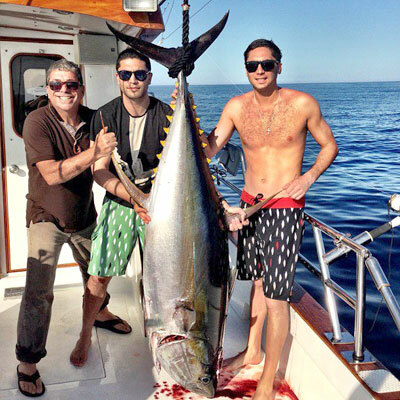 Yellowfin Tuna are moving into the area months early this year with the unusually warm water temperatures. Actually have been hanging in the area for the last several Weeks. Dorado are here also months earlier than last year. Sailfish, Striped Marlin, they’re all here waiting for you to entice them to give you a life-long experience you´ll never forget. The first time you see a Sailfish or Marlin hurl itself from our sapphire blue waters, you´ll wonder why you waited so long to have this experience. For those who are venturing out to the Marietta Islands, El Banco or Corbetena will find these famous fishing grounds to themselves for the most part. So enjoy the quiet, the fishing and the beauty of Puerto Vallarta at the best time of the year to be in Paradise!